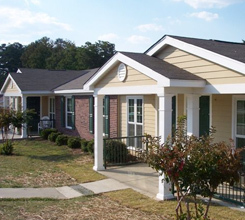 Located in the beautiful City of West Point, Georgia the property consists of 223 housing units which feature gas/electric stoves, refrigerators, marble kitchen counter tops and washer/dryer connections. The property also has 2 children’s play areas and an often used outdoor basketball court. These various peaceful communities give you a place to grow and a sense of family. Floor plans range from studio units to 5 bedroom units available for your needs. 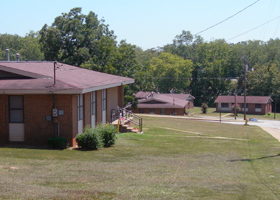 Our residents are also able to access The West Point Senior Center, The Technology Center where West Georgia Technical College offers G.E.D and Adult Education classes and the West Point Youth Services Facility which formerly served as West Point Boys and Girls Club site. These facilities are conveniently located behind The Housing Authority of the City of West Point campus. There is a part-time van driver to assist our residents with transportation to medical appointments as well as appointments for services. There is also transportation to our weekly community soup kitchen sponsored by local ministries. We also provide support and assistance to our residents courtesy of our ROSS (Resident Opportunity for Self Sufficiency) Program. This program is designed to work with residents to create a path to self sufficiency for our residents by connecting them to available community resources and helping them achieve their goals.